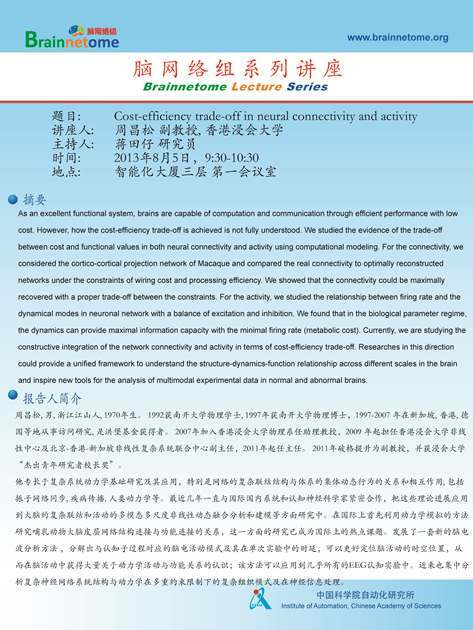 Prof. Zhou's Lecture-Cost-efficiency trade-off in neural connectivity and activity. Cost-efficiency trade-off in neural connectivity and activity. As an excellent functional system, brains are capable of computation and communication through efficient performance with low cost. However, how the cost-efficiency trade-off is achieved is not fully understood. We studied the evidence of the trade-off between cost and functional values in both neural connectivity and activity using computational modeling. For the connectivity, we considered the cortico-cortical projection network of Macaque and compared the real connectivity to optimally reconstructed networks under the constraints of wiring cost and processing efficiency. We showed that the connectivity could be maximally recovered with a proper trade-off between the constraints. For the activity, we studied the relationship between firing rate and the dynamical modes in neuronal network with a balance of excitation and inhibition. We found that in the biological parameter regime, the dynamics can provide maximal information capacity with the minimal firing rate (metabolic cost). Currently, we are studying the constructive integration of the network connectivity and activity in terms of cost-efficiency trade-off. Researches in this direction could provide a unified framework to understand the structure-dynamics-function relationship across different scales in the brain and inspire new tools for the analysis of multimodal experimental data in normal and abnormal brains.